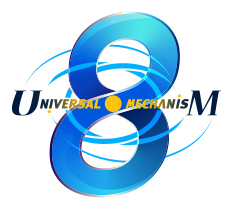 Download Universal Mechanism 8.3.4.3 (April 5, 2019) and install the program on your hard disk. You can use Universal Mechanism for one month after installation for education purposes only. Free 6-month educational license is provided for (PhD) students on request. To obtain a student UM license generate a request-file in UM Input or UM Simulation programs (Help/About/Registration) and send it to registration@universalmechanism.com. Do not forget to attach a scan copy of your student ID to your request. The license file will be sent you in reply. This installation of Universal Mechanism includes all available UM modules and user,s manuals. - load models from Samples directory and run it. After that use manuals from the Getting started series to get quick start in using Universal Mechanism. 762 Mb Universal Mechanism 8 release. Revision history since October 2014 is available here. 883 Mb New release! Universal Mechanism 8.5 with new graphical engine, beta version. Release notes are published here. 808 Mb This is the last installation that includes both 32- and 64-bit executable files. All next releases include 64-bit files only. 932 Mb This is the last installation that includes both 32- and 64-bit executable files. All next releases include 64-bit files only. UM 8.5 is the intermediate version with the new graphical engine in UM Simulation program. um_samples_vbi.zip 474 Mb Additional samples for UM VBI module: simulation of vehicle-bridge interaction. um_samples_rcf.zip 6 Mb Additional samples for UM Rolling Contact Fatigue module: simulation of contact fatigue of railway wheels. um_samples_fws.zip 52 Mb Additional samples for UM Flexible wheelset: dynamic simulation of rail vehicles taking into account flexibility of wheelsets. um_samples_fem_monorail.zip 89 Mb Additional samples for UM FEM Monorail: dynamic simulation of parts of flexible monorail tracks using FEM subsystems. um_samples_fem_maglev_monorail.zip 281 Mb Additional samples for UM FEM Maglev track: dynamic simulation of parts of flexible maglev tracks using FEM subsystems. 1,4 Mb Free utility for export data from Autodesk Inventor to UM CAD file. It supports 32- and 64-bit versions of Autodesk Inventor starting with Autodesk Inventor 2013. 0,9 Mb Free utility for export data from SolidWorks to UM CAD file. It supports 32- and 64-bit versions of SolidWorks starting with SolidWorks 2012. 8,2 Mb Free utility for export data from Creo to UM CAD file. It supports 32- and 64-bit versions of Creo starting with Creo 1.0. 5,4 Mb Free utility for export data from Pro/ENGINEER to UM CAD file. It supports 32- and 64-bit versions of Pro/ENGINEER WildFire 4 and 5. 12,5 Mb New release! Free utility to convert data from STEP and IGES files fo UM CAD file format, beta version. what_is_new_in_um8.pdf 1,0 Mb Description of new features of UM 8 version. umballast.zip 19 Mb Modeling of granular media in UM (PowerPoint presentation, ZIP-archive, Russian lang., with animations). extremerobotics2010.zip 266 Mb Real-time simulation of wheeled and tracked (PowerPoint presentation in zip-archive). um_wear_eng.zip 12 Mb Modeling wear of wheel and rail in the PC "Universal Mechanism" robots in UM, (PowerPoint presentation, zip-archive). um_rcf.zip 64 Mb Simulation of accumulation of contact fatigue damages in railway wheels with the help of Universal Mechanism software, (PowerPoint presentation, zip-archive). um_three_piece_bogie.zip 15 Mb Simulation of Dynamics of Freight Car based on Three-Piece Bogies: Mathematical Model, Safety, Wear, (PowerPoint presentation, zip-archive). derailments.zip 23 Mb Simulation of train derailment processes and the identification of causes of derailments by using Universal mechanism software are considered, (PowerPoint presentation, zip-archive). um_train_simulator.zip 14 Mb Presentation is devoted to the numerical simulation of train dynamics in real time and the practical application of such simulation - train simulator software, (PowerPoint presentation, zip-archive). predicting_railway_wheel_wear.zip 2,8 Mb Predicting wear of railway wheel profiles in program package "Universal Mechanism": methods and approaches, (PowerPoint presentation, zip-archive). umtraining.pdf 12 Kb UM model railway vehicle dynamics simulation training program dedicated to the final purchase UM program modules and features of the model and the goals of customers depend on. umlite70.exe 26 Mb Simplified version of Universal Mechanism software is intended for a variety of users. It requires no special knowledge of the design engineer terms and ideas.